Show your kids smarter animated films, advises Raja Sen. 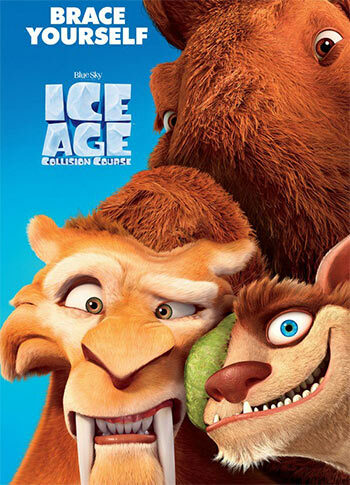 I haven’t watched all the Ice Age movies, but, to be fair, I doubt anyone has. Before walking into a press screening, multiple critics who hadn’t missed an installment of the franchise assured me helpfully that this was the fourth film. It happens actually to be the fifth, but who can blame even fans of the series for losing count? These are mostly harmless, mostly charmless cartoon films about loud, silly characters who seem always to be battling insurmountable obstacles that always prove, in the end, to be rather easy to surmount. In a world where Studio Ghibli and Pixar exist and routinely give us all-ages work of stunning sophistication, these are films of a bygone era written in the style of corny old sitcoms, as if meant to be accompanied by canned laughter. The plot is set into motion by Scrat -- a saber-toothed squirrel who is essentially Wile E Coyote minus the ingenuity -- chasing eternally after an acorn. He sets an alien spaceship free from its frozen resting place, and the sequence of events that follows, in highly convoluted fashion, sets a giant asteroid hurtling towards Earth and mammoth gang. But hey, at least this gives astrophysicist Neil DeGrasse Tyson the chance to cameo as a weasel who explains things, one of the film’s few gags that work. The bright spots are few and far between, and ideally -- if you’re a parent looking to distract a child for a while -- you ought to aim higher than this festival of poop-jokes and repetitive slapstick. Adults, who watch and approve of this film, should be judged without reservation, of course. Even Offerman and Romano sound bored, a luxury not offered to Simon Pegg, here playing a hyperactive one-eyed weasel with a pumpkin for a daughter. It is a character ultimately exhausting to watch, as, indeed, is this film. Skate away from the rink, I’d say. This franchise is on thin ice.